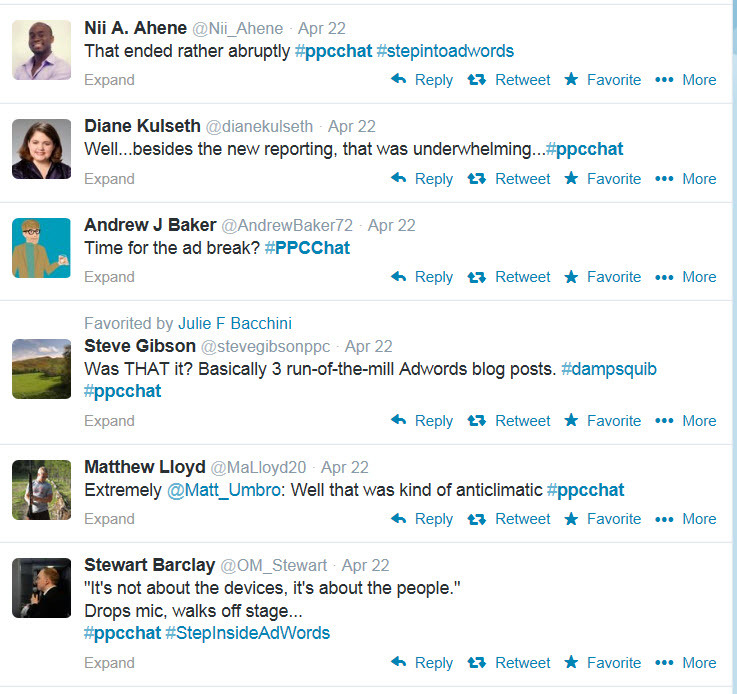 The subject of broad match gone wild is a popular one in PPC, and has been since the dawn of search query reports. Search marketers frequently lament the irrelevant and sometimes downright puzzling queries which triggered their ads. In fact, better search query matching was one of my 2007 PPC wishes that still hasn’t come true. A few weeks ago, I was doing routine search query report reviews for one of our international clients. We use broad match on their branded terms to cast as wide a net as possible, and we use extensive negative keywords to control the wildness. Anyway, I pulled a SQR for our Germany campaigns, and then pulled one for the US. Again, the task was all typical – but the report results were anything but. 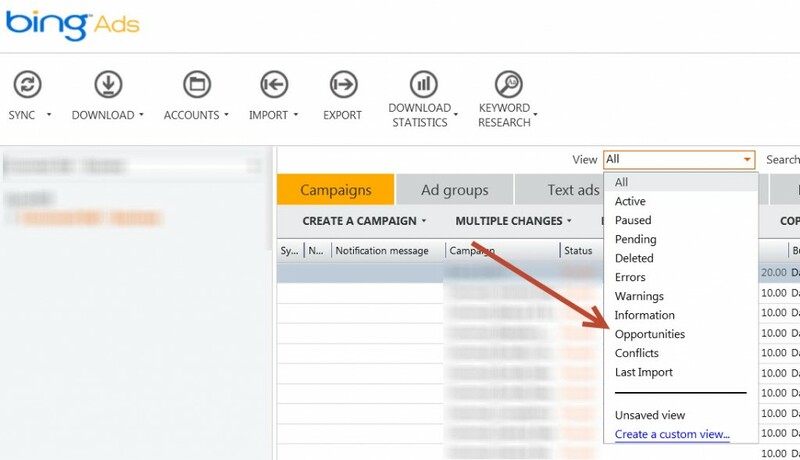 We’ve created ad groups by match type for control and new search query mining, using the SQRs for not only negatives, but new positive keywords to add to our account. 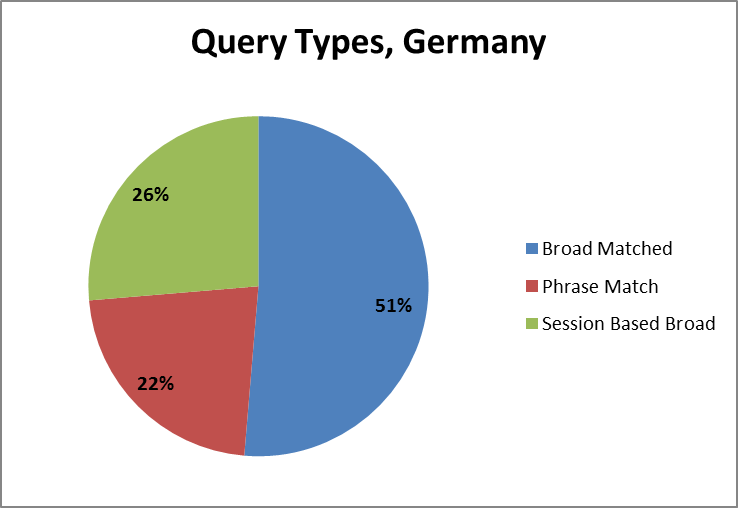 For both Germany and the US, I looked at just 2 keywords this time: the broad match and phrase match of the client’s brand. I noticed that reviewing Germany’s report took a lot less time than reviewing the US report. This came as a surprise, since our branded campaigns are set to “all languages” and I had to pore over German-language keywords in the SQR as a non-German speaker (Google Translate is my best friend for this). So I decided to compare the two reports. What I discovered stunned me. Allow me to illustrate with a few visuals. Look at the total number of search queries: the US has nearly 3 times as many as Germany. Remember, this is on the same 2 keywords! That’s the stat that got me started on this in the first place. I find it hard to believe that people in the US are 3 times more creative than people in Germany when it comes to searching for the client’s brand (or searching for anything, for that matter). This goes a long way towards explaining why our US CPCs are so much higher than other countries for this client. I know that the PPC market in general is more saturated here than elsewhere. If nothing else, there are more US-based advertisers. And our population is 3 times bigger than Germany’s (82 million for Germany vs. 311 million for the US), so I might accept the notion that if every person in each country conducts one unique search related to these 2 keywords, we’d see 3 times as many SQs in the US as in Germany. I think it’s a stretch, but it’s at least plausible. 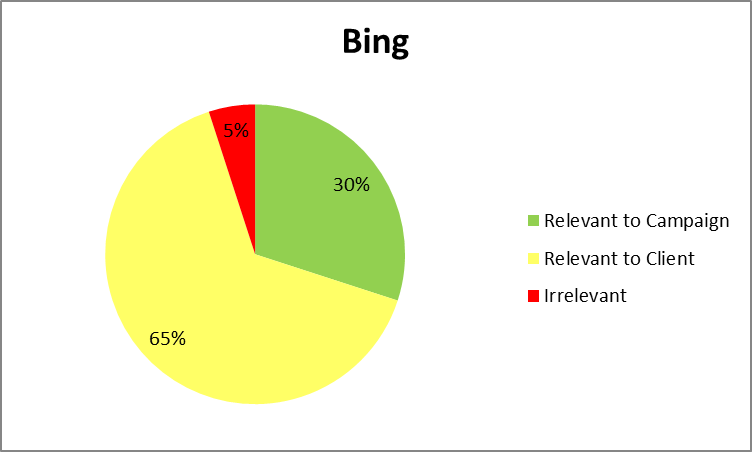 But let’s look at search query distribution across match types. Remember, we’ve segmented our ad groups by match type, so there are no exact matches. What’s left in the SQR is broad, phrase, and session based broad. A couple of visuals will make this easier. Let’s look at Germany first. 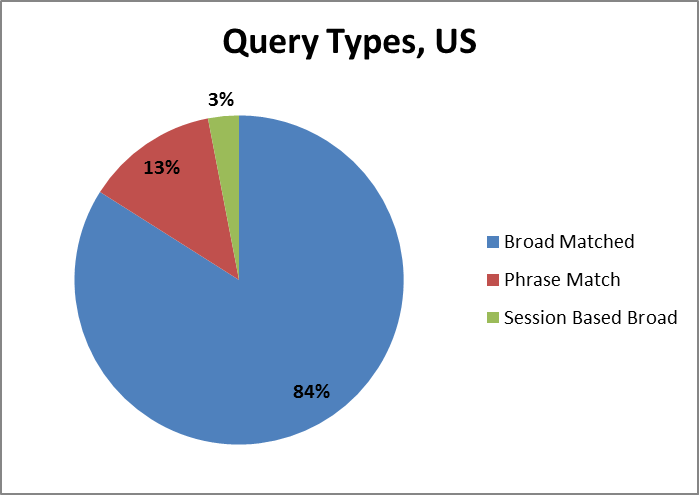 Half of the queries were broad matched, and the rest were pretty evenly distributed between phrase match and session-based broad match. I’m not thrilled about the high percentage of session-based broad matches, but that’s another post. Still, the fact that over 1 in 5 matches were phrase match isn’t too bad. Now let’s look at the US. Are you as speechless as I am? Fully 84% of the matches in the US were broad match (and remember folks, there were 860 of them, compared with 193 in Germany). There were virtually no session-based broad matches, so at least we have that going for us. But only 15% phrase matches, vs. 22% in Germany? Why, Google, why? And here’s the kicker – you know this is coming – the US SQR is loaded with totally irrelevant queries. Have you seen similar behavior in your international campaigns? Are we Americans really that much more creative in our searches? Or is Google showing their patriotism by fleecing us? Share your thoughts in the comments! Is Adwords Turning Into Big Brother? Over the past few weeks, Google has rolled out a few changes that seem to imply that they know what’s best for all of us. (I know this isn’t new, but bear with me…) There’s Google Plus, with its +1 boxes on search results & ads that you can’t opt out of; and the SSL fail that’s masking as much as 20% of organic search query data. Earlier this week, there was a post on the Inside Adwords blog, announcing that all Adwords campaigns using Enhanced CPC and Conversion Optimizer would have ad rotation automatically switched from “optimize for clicks” to “optimize for conversions” – unless you opt out by filling out a form. Thing was, the link to the form went to a 404 page. And then the post was pulled down shortly after it went live. It’s back up now, and the form actually works. But what the heck was that all about? Let’s set aside the fact that Adwords obviously jumped the gun on a blog post that wasn’t ready for prime time. Anyone who blogs has probably done that once or twice. The bigger issue is that Google is once again taking choice out of the hands of marketers and advertisers, opting instead to decide what they think is best for us. In some ways, this makes sense. The whole point of using Enhanced CPC and Conversion Optimizer is to try to improve the conversion rate and cost per conversion of your campaigns. Therefore, using the “optimize for clicks” setting is at odds with the Enhanced CPC/Conversion Optimizer algorithm. In fact, it’s likely that this factor alone has led to less-than-stellar performance for campaigns with these settings – leading advertisers to say that Enhanced CPC and Conversion Optimizer don’t work. That’s bad for Google. Also, remember that Optimize for Clicks is the default campaign setting. 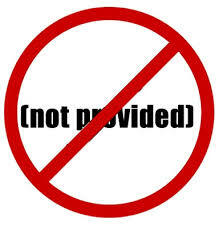 This means that many novice advertisers are using this setting unwittingly. Consider a scenario in which these same novice advertisers read a blog post touting the benefits of Enhanced CPC or Conversion Optimizer – so the novice says, “Hey, let’s try that,” and then sees poor results because their campaign is still set to “optimize for clicks.” That isn’t good for Google either. But here’s the thing: The blog post said that all campaigns would be switched over unless you opt out by filling out a form. This implies that advertisers won’t even have the option of choosing “optimize for clicks” for Enhanced CPC and Conversion Optimizer campaigns. And this is why I have a problem with it. I’m fine with changing the default for these campaigns to Optimize for Conversions. That’s totally ok. What I’m not fine with is taking the choice out of the hands of the advertiser and putting it in the hands of Google. That’s akin to the fox guarding the hen house. I find this move even more puzzling in light of the flap over the SSL thing. Ever since that announcement, SEMs have been raising holy hell, asking for more data and transparency. It seems like a bad move to decide to make this change now, on the heels of all the furor – and right before the holidays to boot. I good-naturedly told them that they just hit a hot button (and they obviously don’t read my blog and have never heard me speak at conferences), and they quickly backpedaled. But still – why is Google all of a sudden pushing “optimize for conversions” rather than letting us make the choice ourselves? Has 1984 arrived a couple decades late? Back in October, Google changed the way search queries were passed to web analytics, and not in a good way. I wrote about this at length at the time, so if you’ve been away from the web for a while and aren’t aware of this, go give it a read. 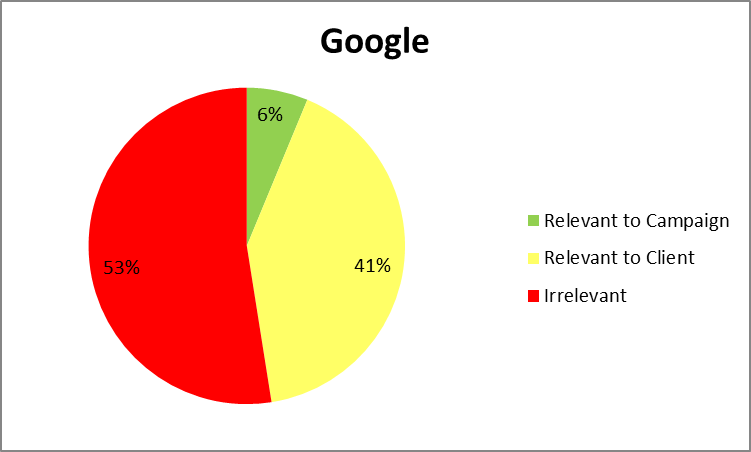 When the announcement was made, Google claimed that the percentage of searches performed by logged-in users was small, in the low single digits. But the data is showing otherwise. SEMs across the web are claiming that the percentage is much higher: as much as 20% in some cases. Think about that for a minute: You’re now losing organic search query data for 1 out of every 5 visitors to your website. Ouch. However, as I said in my earlier article, the percent will naturally vary across websites, depending on the vertical, customer base, etc. So how does that make Google a Scrooge? Well, shortly after they launched this hugely unpopular change, they rolled out Google Plus pages for businesses. Previously, the lack of business pages in Google Plus was a big hole in the service – businesses were clamoring for the ability to have a page for their business in Google Plus. And now they have that ability. And how do users connect with businesses on Google Plus? Well, they have to have their own Google Plus account – and they have to be signed in to Google to connect. And most users, once logged in to Google, don’t bother to log back out before they start performing searches. Uh oh. Do you see where this is headed? And that, my friends, is a great big BAH HUMBUG to everyone who cares about search query data.